The Pension Plaza is one of the precious complexes in Rwanda’s Business District, right at the rooftop is Crystal Ventures Headquarters, although they do not do any branding anymore. KPMG is right in this building as well. Many more corporate firms such as Kenya Port Authority and UAP, shown clearly in another photo of this complex from its front. This Centenary Building is one of the first commercial complexes that were elected in Kigali, almost two decades ago. Saham Insurance has occupied some good space in here. The famous Rwanda Credit Bureau works from here too. On the Other wing Simba Supermarket management operates from there, COGEBANK too. Africa’s youngest billionaire Ashish Thakkar does not like this Bank Populaire (BPR) office. He has invested in a storied office which is about to be completed right on the left side of this small glass-walled building. They say old is gold, but not for this SORAS complex. The building is durable, built in almost four decades ago. It being between massive complexes including the humongous Marriott Hotel just 100 meters and the BRD office, SORAS looks misplaced. The World Bank works in the same complex on the right side. The terror one gets from the old and worn out lifts is unimaginable. For a government corporate company, this is very fine. RDB is one of the beautiful government complexes. No need of more than this, except that it sits on a large piece of land and looks like so much space was wasted, both on the ground and above the ground. It is just 6 floors. Sharing walls with SORAS, the Development Bank of Rwanda has improved the looks of their complex. The building looks magnificent. This tinny building is well painted, but the inside is a little old as its name, SONARWA. It looks beautiful despite occupying a huge space that should be exploited. This is one of the youngest buildings in town. Kigali Heights is home to many brands such as Tigo who are on the 6th floor right beneath the antennas you see. Korea Telecom (ktRN) is also in this complex. Other brands include Mr. Price (with their expensive clothes, jeez!). Java House is here too, so is Riders Lounge, beautiful setting with their unreasonable prices. The Water Utility (WASAC) is one of the new faces. BBOXX Rwanda is also here. Beautiful office. Umuyenzi Llaza is home to a few brands such as Urwego Opportunity Bank. Located a few meters from the Gisimenti round about as one heads to the Kigali International airport. Not bad at all. AB Bank Rwanda chose to hide from here. This is also one of the oldest buildings in town; the famous BCK complex 100 meters from Ecole Belgie. Prime Insurance is at the Pension Plaza. Have you seen the masters of bakery, Brioche, they are in here on ground floor. There is no much to say about this. Unguka Bank works from here with a some SMEs all compacted there. That Ubumwe Plaza is home to Ubumwe Hotel and Bank Of Africa, former Agaseke Bank. Be at the rooftop, and all the stress from the long day will evaporate. Nice Building. Britam Insurance, Access bank and other brands are here. The iconic UTC. How Crane Bank ended up here, only owners know. Ask anyone about Blues Cafe, and anyone on the street will tell you where it is, but no Crane Bank. Possibly the bank was targeting the businesses around this area, but the location has shadowed the brand. A bonus of the Insurance Plaza, Equity Bank Headquarters is right here. It was a great choice, but the car free zone messed up Equity Bank’s idea of a strategic position. With all the money, the brand size, Rwanda’s brewery has no beautiful office. This is just improvising; located opposite the Tourism University, SONATUBE. It however is well decorated inside. GT Bank, on the street to Serena and Marriott Hotel, they chose to remain small, but beautiful. KCB has never recovered from the introduction of the car free zone despite having rented an old building and tried their best to paint it so much green. We are told they have a few months to relocate to an attractive and larger office, most probably M-Peace Plaza. 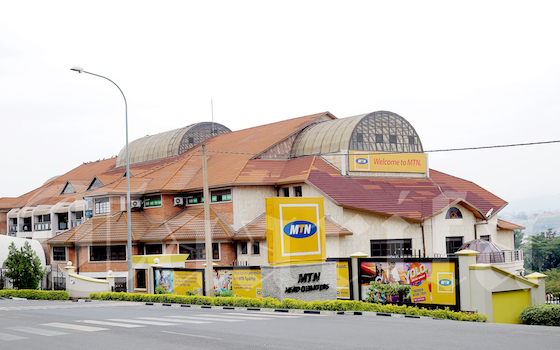 MTN has been here for ages, and they don’t seem to move anytime soon because they leased the complex. The firm has however grown to the extent that they have recently taken the marketing department to another building. It is not worth photographing, though. How the marketing department was taken to an ugly office baffled us. These private security officers have an office, very beautiful. ISCO is big, and the office tells it all. The size of the firm and the office don’t match. The building looks bigger than the size of the firm. No pun intended. Good for them. I&M has changed names, same as the look of the complex. The office complex has enough legroom and they are expanding to even more space just opposite GT Bank. The envy they create at GT Bank has no cure. The Pan-African Bank, ECOBANK has been here for ages. Could it be the reason the Bank doesn’t care about the looks of this well shaped building. It looks nice from the outside, but inside the building needs a lot of retouch. Painting at least. Small but beautiful. This building is near the Amahoro National Stadium, just opposite former UN Offices in Remera. Apparently Zigama CSS, the military Bank, owns this magnificent complex with the Rwanda Governance Governance Board as a tenant. And here comes Bank Of Kigali. The bank does not only own this massive office, but it also is the largest bank in the country. Big is big. Beautiful offices inside with ample space. How the bank predicted the car free zone policy is only known to the. Their parking entrance narrowly survived, 20 meters just.Photo Story by Pacific Himbaza and Nicolas Kizza. Editor’s note: Are there offices we should have captured and we did not? Please share your views and photos, we will publish them.